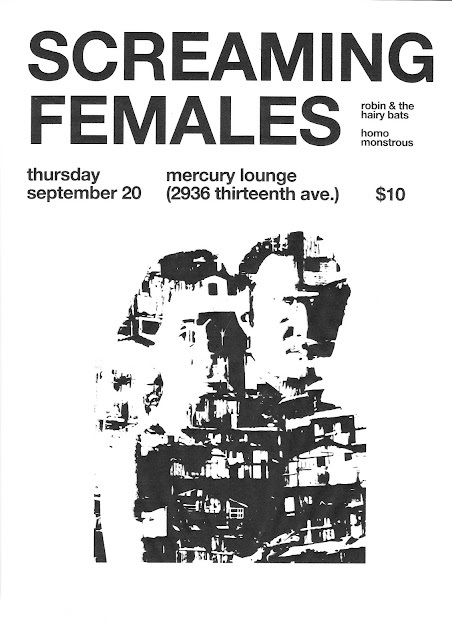 New Jersey indie/punks SCREAMING FEMALES have been so kind as to stop in Regina on their Canadian tour to rip up The Mercury with locals HOMO MONSTROUS (siq queer noise punk) and ROBIN AND THE HAIRY BATS (psychedelic indie punks). Marissa Paternoster, vocals and guitar in SCREAMING FEMALES, was listed as no. 77 in SPIN magazine's top 100 guitarists of all time. Come to this show or lose forever. As usual, GNG record distro will be set up, come buy some siq new records.